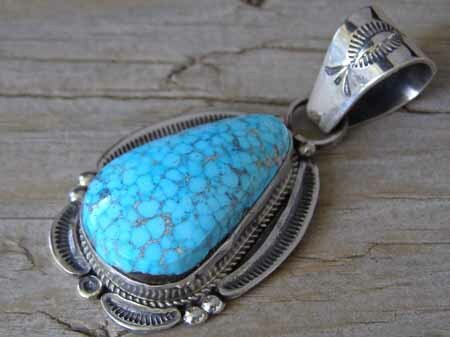 This pendant features a teardrop-shaped stone of natural, untreated Kingman "Birdseye" turquoise from Arizona. The coloration and markings of Kingman "Birdseye" are quite distinctive and this fine turquoise is highly regarded by collectors. Hallmarked R.TOM and stamped STERLING on back. Stone: 1 1/8" x 11/16"
Dimensions of pendant (excluding bale & jump ring): 1 3/8" x 1 1/16"